Blue Oak School’s Middle School is a small community designed to inspire and care for our sixth, seventh and eighth graders as they transition into early adolescence, an important time of change in the lives of children. Blue Oak’s Middle School classes are small, which allows us to provide our students with individual attention and small-group instruction. This is a key ingredient in Middle School learning, which depends on a strong personalized relationship between the student and teacher. The Middle School schedule is built on long blocks of time, recognizing that students learn best when time in school is organized to promote student-directed inquiry and experiential learning. The Middle School day also includes time for rest and relaxation during planned breaks and an all-school lunch period. Blue Oak’s Middle School teachers continue to challenge our students with meaningful academic work at the same time as they nurture each student’s non-cognitive tool-set – important behaviors and dispositions including social resilience, academic perseverance, and a what psychologists call a flexible “change mindset.” Through our attention to the needs of the whole child, Blue Oak nurtures well-rounded individuals and prepares our students to succeed. Every Blue Oak Middle School student is a member of a small advisory group, the cornerstone of our learning community. Advisors are attentive to our Middle School students’ social-emotional well-being and their overall academic growth. Advisors forge significant relationships with their students to help them succeed both inside and outside of the classroom. Advisors are also the main contact person for parents, and they make sure parents are aware of successes and problems that might arise at school. In advisory meetings, students engage in activities designed to develop a greater sense of awareness, a greater sense of self, and a greater sense of community. Advisors help students learn how to set academic and social goals, and they encourage students to reflect on their goals. Advisory group members also support each other and they celebrate each other’s successes throughout the year. Blue Oak’s advising program develops students’ leadership skills that are then practiced in larger grade level and school-wide meetings. The Advisory group is also the center for community service for the Middle School. Blue Oak sixth graders take classes in math, science, humanities, studio art, Spanish, PE, music, and drama. Students also participate in our electives program which enables students to explore non-traditional classes in a wide array of subjects. Sixth grade enjoys the chance to explore off-campus with trips around Napa and regular experiences at the school’s partner farm. The sixth-grade curriculum is a well-paced, integrated exploration centered around the connections among ancient civilizations, math, science, and art. Humanities (integrated social studies, literature, and language arts) begins the year with an adventurous exploration of the Silk Road and the diffusion of cultures via languages, dress, medicines, religions, food, music, and traded goods. Students spend the year exploring maps, investigating life in ancient China, Persia and the Roman Empire. Sixth-graders develop their voice as writers, practice writing techniques, and present their work for critique. Reading takes a two-fold approach as students hone their skills of reading for understanding and explore new genres, styles, and types of literature. Like humanities, sixth-grade math is multilayered and challenges students to become mathematicians through hands-on projects and integrated assignments. Students encounter and explore many traditional math concepts such as fractions, decimals, percentages, positive and negative numbers, and multi-step equations through projects integrated with humanities, science, and art. In science class, students learn to use the scientific method to direct and shape their explorations of their local world, the larger modern world, and connections are made to the science of cultures along the Silk Road. Through hands-on projects and experiments, students become familiar with seeing their world as scientists, and they begin to understand other peoples and other perspectives. Students apply their newly acquired skills, techniques, and perspectives to better understand and gain new knowledge while engaged in off-campus field work. Sixth-grade science ends the year with students practicing their skills as scientists by developing their own Science Fair Research Projects and presenting their findings to the Blue Oak community. Blue Oak seventh graders continue to take classes in math, science, humanities, studio art, Spanish, PE, music, and drama. They also participate in our rich and varied electives program that allows students to discover new interests. All Middle School students participate in our advisory program which enables them to develop a more meaningful community with their advisor and with fellow students. In humanities (integrated social studies, literature, and language arts) class Blue Oak seventh graders investigate humans and their geographical surroundings through map-making, interpreting charts and graphs, studying census data, and creating their own country. Students read independently outside of class and track their progress with reading responses, blog posts, summaries, and book reviews. Blue Oak seventh graders become skilled authors of persuasive essays and they learn to craft a speech. Seventh graders apply their skills by tackling a real-world problem and developing a tenable action plan. 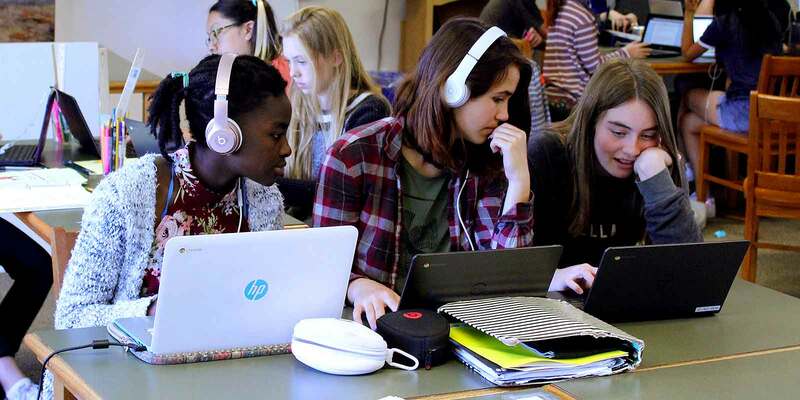 Through this project, students write, edit, and revise plans, blogs, annotated bibliographies, and reading responses to strengthen their writing skills. In some years this project has connected Blue Oak students to other young scholars through organizations like NAIS 20/20 and the World Savvy Challenge. Blue Oak’s Middle School students’ natural sense of curiosity serves as the foundation from which they build an increasingly sophisticated understanding of scientific concepts. The seventh-grade science program provides a wide variety of hands-on laboratory experiences that continue to challenge our young scientists to inquire, hypothesize, research, measure, analyze, collaborate, and test science concepts. Seventh-grade investigations include the exploration of such exciting topics as the density of solids, the Big Bang theory, the Earth’s seasons, seismology-epicenter location and magnitude determination, and Napa Creek hydrology. In the seventh grade, Blue Oak students engage in a year of pre-algebra study beginning with getting organized through the study of data interpretation. Students go deeper into the study of integers and their use in mathematics, and they explore probability through games and story scenarios. Students begin the formal study of algebra by writing algebraic sentences and they learn to solve them through a variety of strategies. Blue Oak’s eighth graders continue their studies in math, science, humanities, studio art, Spanish, PE, music, and drama. They also explore their personal interests in our elective classes, and they continue to enjoy a personalized relationship with their advisory group. Our eighth-graders also take a class in High School Readiness that introduces them to their high school options and prepares them for application processes and placement tests. In eighth-grade humanities (integrated social studies, literature, and language arts) our students investigate the roles of United States citizens and its democracy. Through the study of history, current events, and literature, students explore our nation. They examine how our government formed in the 18th century and assess how well it functions in the 21st century. Roles, rights, and responsibilities of United States citizens are scrutinized with an emphasis on social justice. Students use primary and secondary sources for research, and they investigate how history is told and retold, made and maintained. Through the reading of literature and literary nonfiction, students gain familiarity with literary and cultural knowledge, they learn how to probe texts for deeper understanding, and they obtain social and emotional insights into human nature. Students write with a keen focus on essays, research papers, and creative work (both fictional and nonfictional). Presentation skills are honed on an on-going basis as students publicly present their learning in a multitude of ways throughout the school year. The eighth-grade science program continues to challenge students to be scientists. Areas of study include gravity, Newton’s laws of motion, thermal energy transfer and the energy stored in food, and physical and chemical properties and changes. A highlight of our eighth graders final semester at Blue Oak is the class trip, a multi-night trip that provides a hands-on science experience. In the past, these trips have involved paleontological digs and the study of marine biology. In math, Blue Oak eighth graders continue to study the concepts of algebra. They start the year with a review of algebraic expressions and equations and go on to apply their skills to real-world problems and intriguing situations. Students practice solving for two variables in two equations, investigate polynomials, and become familiar with the quadratic equation. Blue Oak students are given lots of ways to practice math and as they take the time to reflect in writing as they review their work and select pieces for display. The 8th-grade school year culminates in a Capstone Project, a sustained investigation of a pointed research question. Capstone projects have ranged from building a computer to learning to read X-rays. Whatever the area of inquiry, students are challenged to research both secondary and primary sources, and every student must identify and interview an expert. Eighth graders present their projects to the community each May. Elective classes also provide students with the opportunity to discover a new interest. By design, Blue Oak’s Middle School electives are multi-age giving students the chance to develop friendships with students in all the grades. The elective catalog is published and shared with the community every spring. Students discuss their options with their parents and their advisors before making their requests. Visual art is a core component of a Blue Oak School education. At Blue Oak students develop a visual literacy and a love for the visual arts through an enjoyable, broad-based curriculum. Our teachers design activities that challenge students to problem solve and take risks while exploring a wide variety of techniques and media. Our Middle School students more deeply explore the elements of art and design which are often integrated with other subjects. Projects are designed to promote creativity — there is never one right answer or one right way. Students are also encouraged to tinker and build as they explore the connections between visual creativity and introductory robotics. In addition to traditional media and materials, the middle school studio’s hand tools and power tools introduce students to industrial arts. Students also use iPad apps and computer programs to create sophisticated digital artwork, graphic designs, and animations. Music is a key component of the Blue Oak experience. In the Lower School, activities build on what children naturally love to do: sing, move, dance, play instruments, clap, and keep a beat. Frequent music-making in the early years provides the solid foundation needed for deep, musical understanding. Instruction is eclectic, combining the best practices of Orff Schulwerk, Education Through Music, and Kodaly. By the time our students arrive at our Middle School, music is a natural part of who they are. Blue Oak Middle School students take a band class where they study the basic elements of blues, rock, soul and funk through an applied approach of playing and listening. Students learn about basic instrumentation, song structure, composition, musical expression, and music theory as they try their hand at bass, guitar, drums, keyboards, and of course, vocals. Musical study in the Middle School is often integrated with the humanities through investigations into the history of music. Students work in groups to learn complete pieces that are performed for the community. Interested students are encouraged to enroll in specialized electives. Blue Oak students are also introduced to formal dramatic study in the Middle School. Our Middle School students explore character through improvisation and creative dramatics, and they learn to deliver monologs and to work as members of an ensemble. Students also explore the connections between theater and literature, culture and history as they learn to appreciate the important role of the arts in society. Seventh- and eighth-grade students are encouraged to audition for the Middle School production, which marries music and drama. Blue Oak’s developmentally appropriate method of scaffolding technology use provides our students with the strong foundation they will need to succeed as savvy citizens of an increasingly digital society. In Middle School, Blue Oak School students use various types of technology to gather information, communicate, illustrate and solve problems. Students in our upper grades also practice the thoughtful and responsible consumption of information by learning to access, evaluate and appropriately use information from online sources. All Blue Oak students and parents are asked to sign an Acceptable Use of Technology Agreement. While not required, we encourage parents to purchase their Middle School student a Chromebook for use at school. The Chromebook is lightweight, has a long battery life, offers quick and easy access to the Internet, Blue Oak Mail, and Google Apps, and gives students an essential keyboard to improve their skills and speed at typing. For students who do not bring their own device, a variety of tools are available for use at school. The high school transition process officially begins in the late spring of the seventh-grade year when parents are invited to an evening meeting to learn about what lies ahead and their role in the process. High school placement and entrance exam preparation also begin in the spring of seventh grade and continue in the fall of eighth grade in the High School Readiness class, which meets weekly. Students develop skills to write their essays for applications in the High School Readiness Class. They also practice interviewing skills and have a mock interview before heading off to prospective high school visits. Each year admissions officers and school administrators visit Blue Oak to speak to our community about their schools. Each Blue Oak family has the chance to meet with our high school readiness teacher to receive individualized advice and support. Blue Oak maintains positive relationships with a wide-range of high schools and educates them about Blue Oak’s philosophy, mission, and our students. Letters of recommendation are completed for students by our math and humanities teachers, and the High School Readiness Director. All required application materials (transcripts, letters) are sent to the appropriate high schools.